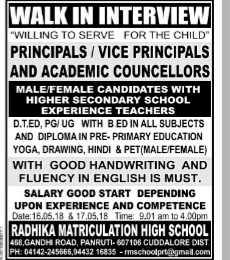 Radhika Matriculation High School ,Panruti has advertised in THE DINAMALAR newspaper for recruitment of Principal/Vice Principal/Teachers jobs vacancies. Interested and eligible job aspirants are requested to attend interview on 1605.2018,17.05.2018.Check out further more details below. About School: Radhika Matriculation School is categorized under Hindi medium School, which is located in Panruti, Pondicherry, Tamil Nadu. English communication skills are highly essential for all positions. Reference: Advertisement on THE DINAMALAR Newspaper dated on 15th May 2018.